Here is the text of my address on March 4th of this year in commemoration of National Pancake Day. The original text was live tweeted from the kitchen. Citizens, do not support the candidate who appears briefly at a pancake breakfast in the AM and then quickly jets back to Washington for champagne brunch. I ask you with due respect; do not serve the public servant who does not first serve the pancake. As your congressional pancake person, I pledge to keep a tall stack on my desk in the house chamber at all times, so that my constituents can see that I have not forgotten the evidence of our blessings. As your painter of pancakes, I promise to always depict the pancake with truth and righteousness, with justice and honor, and usually with butter and syrup. Most importantly, as your representative from the 2nd District, I will lead the fight to have all public water towers converted to dispensers of batter, so that no citizen need worry about the source of their next pancake. As we enter a new breakfast age, I invite you to join me at that table, a pancake in each of our upraised hands, singing not Pfannkuchen über alles but Pfannkuchen mit allem; 'Pancakes With Everything', for no other dish could best represent the fulfillment of our long national journey. 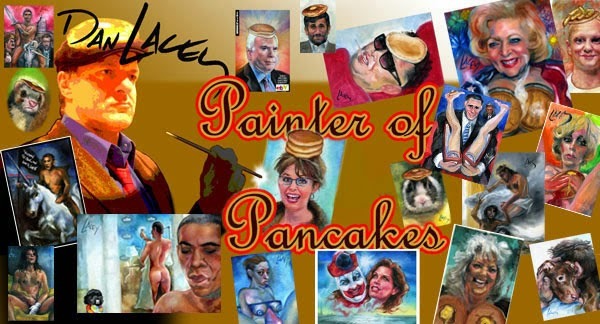 Please enjoy this video I put together which features 500 or so of my pancake themed paintings. Happy Pancake Day!